Wood fences provide a more natural look and are easy to modify. You’ve made the decision to get a fence installed in your home, but that was the easy part. Now, you have to decide which type of fence is best for you. There are a variety of different types and materials used for residential fences that you probably have never even considered. First, you have to figure out what your reason is for buying a fence in the first place. Residential fences can serve many purposes. You may have decided to get one because you like your privacy and don’t want to see your neighbors everytime you walk out of the door. Maybe, you want a fence for security reasons. 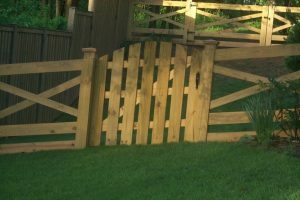 A fence can help to keep pets and children in, as well as unwanted intruders out. Then, there is always the option that you just want a fence because you think it will look nice around your yard. After you have clarified a specific reason for wanting a fence, go ahead and narrow down a budget for it. Wood Fences: These fences provide a more natural look and are easy to modify. A simple paint job can completely change the look of your wooden fence. Wooden fences are not only affordable but also very easy to install. Metal Fences: Though these are thought to be associated with commercial land, they can also be used as a residential fence. These are great for keeping your pets and children inside of your property. They also have a variety of styles, from a basic chain link fence to a vinyl type that comes in an array of colors. These fences are also affordable and require little to no maintenance. Vinyl Fences: Also known as PVC fences, this type is one of the most popular among homeowners. This type of fencing is very visually appealing, though not the cheapest material to choose. They are very low maintenance and the color does not require much touching up. This is a very strong material and you do not have to worry about rusting or rotting. It is very well worth the few extra dollars! This entry was posted on Friday, January 26th, 2018 at 12:09 pm. Both comments and pings are currently closed.